For many, many years now, I have been aware of the old trapper huts in North-East Greenland and the dedicated effort to restore them; this from conversations with Peter Schmidt Mikkelsen, former Sirius Patrol man, past contributor to The Fan Hitch and one of the fellows dedicated to preserving the Danish and Norwegian trapping history and buildings of the region. But it wasn’t until reading A Trapper in North-East Greenland: Tales of a forgotten way of life that I came to have a better understanding and appreciation of just what these huts and the history of their use meant to Peter and especially to those who lived the trapper way of life during that half-century era beginning in 1908. From 1946 to 1951, as a young man in his early twenties seeking to help pay for his engineering studies and to look for adventure, Norwegian Ivar Ytreland became part of the well-established, well-organized Norwegian and Danish trapping/hunting/fishing community in North-East Greenland. His presence in the north “infected” him with polar fever from which he happily never recovered, influencing him greatly for the rest of his life. A Trapper in North-East Greenland: Tales of a forgotten way of life, is Ytreland’s full-bodied description of the history from the very beginnings of these activities to their last years and well beyond, to restoration projects still very active now two years after his death at age 86 in 2012. His writing is meticulous yet enlightening and engaging, full of details and the minutia of a trapper’s daily schedule which changed with the ebb and flow of his pursued quarry and the two seasons (described as the only two seasons in the vast region): Winter and Summer. Ytreland had to process and preserve his harvest, build or repair almost everything: huts and tents, clothes, skis, sledges and harnesses, ovens, lamps, axes and knives, boats and engines. Ytreland’s adventures describe encounters with, the harvesting and processing of all manner of fauna which includes not only the fur bearing animals (fox, ermine, hare) trapped, but also arctic char, birds and their eggs; land and sea mammals: whale, seal, walrus, polar bear (some live caught for zoos), musk oxen, reindeer and wolves. Ytreland regales us with dozens of stories from his personal experiences and yes, there is a section specific to the sledge dog: its description, behavior and remarkable hunting skills; raising and training and use. The subject of these dogs is peppered throughout a good portion of the book including two notable stories, one of a fan hitch team “navigating” a boulder in the middle of a trail and the other about a five dog fight exploding at the very instant of trying to turn around the fan hitch on the very edge of an impassible and narrow ledge, 15-20 meters above the not entirely frozen sea! The prospect of learning about dogs drew me to read and possibly review A Trapper in North-East Greenland: Tales of a forgotten way of life. 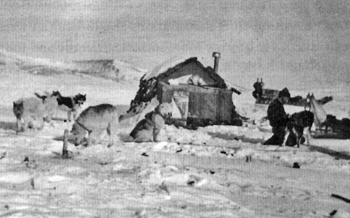 Although Ytreland made it clear just how important the use of sledge dogs were to the trappers, the subject of dogs is not particularly central to the book itself. Nevertheless, this was a volume very difficult to put down, for over every hill, behind every bergy bit, on every page there were engrossing and often vivid descriptions of landscapes, people, buildings, boats and events that completely captured my attention. This reader was able to slip into Ytreland’s mukluks and experience a trapper’s way of life, fortunately not to be forgotten thanks to him and those like him who dedicate themselves to keeping this history alive. A Trapper in North-East Greenland: Tales of a forgotten way of life will appeal to an audience of a very broad range of interests. 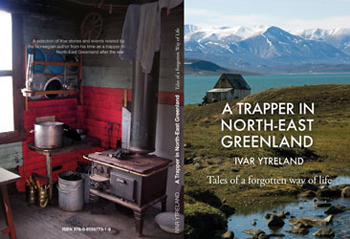 A Trapper in North-East Greenland: Tales of a forgotten way of life; 2014; TWS Publishing; translated from the original Norwegian Polarminner by David Matthews of The Steading Workshop; 239 pages illustrated with color and black & white photographs plus two maps; softcover; ISBN 978-0-9550773-1-9; £16.00 + P&P, available from The Steading Workshop Drummore of Cantray, Cawdor, Nairn, Scotland, IV12 5XT; Email: books@tswpublishing.co.uk.